Who knows what’s really going on with the HTC EVO View 4G of late, but this is the second time this week that we’re seeing an extensive price drop on the Android…Gingerbread...tablet. In fact, we were impressed already with eBay’s daily deal earlier in the week, when it was reduced to an attractive $239.95 price – with no contract signing required for the purchase. 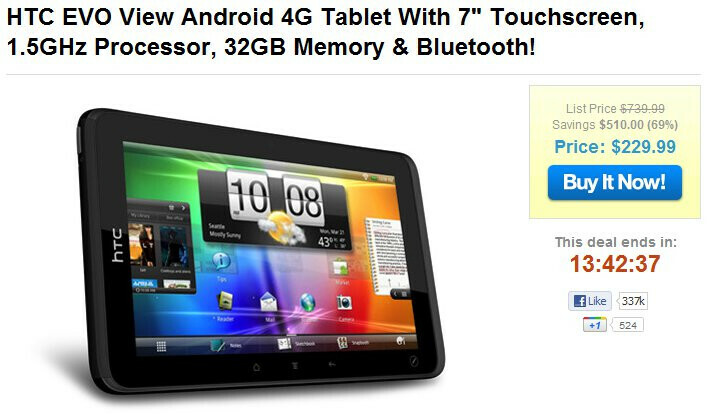 Well, moving down even more in pricing, daily deals web site 1saleaday.com now has the 32GB version of Sprint’s tablet at the oh so wonderful price of $229.99. It’s obviously within Amazon Kindle Fire territory, thus, making it one alluring offer that you can’t possibly pass up on – especially when it’s a full-featured tablet boasting cameras and much more. Shipping is only a mere $4.99, which brings up the total damage to an easy to swallow tag of $234.98, but still, you can’t deny it’s one awesome offer. Now don’t go on thinking about whether or not to pick this dandy deal, that’s because its price is only valid for today – ending when the clock strikes midnight later on tonight. So why don’t you do yourself a favor and simply make that impulse decision right now before it disappears? Is this WiFi only or do I need to connect it with Sprint for it to work? Think about it this way. This is like going into a sprint store and purchasing the tablet flat out with no contract. You can either use it as a wifi only or eventually add a contract onto it. Is contract required or is this 1 time purchase of device? If the latter, I will have to think fast on whether to return the Playbook or not, because even though Playbook is better as far as actual hardware, having android instead of QNX would mean a lot better app selection. This is a no contract Sprint Device. They made a mistake in the specs. 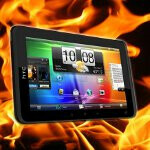 It has a SINGLE Core 1.5Ghz processor and not a Dual Core one like stated.